The Fellowship is a six-month series of workshops and programs that is meant to be an effective, affordable, and intensive training for artists interested in local, community centered, civic actions. Throughout the program, Fellows meet with a diverse roster of artists, activists, arts professionals, curators, funders, and change agents offering strategies for creating and sustaining work at the intersection of the arts and social change sectors. 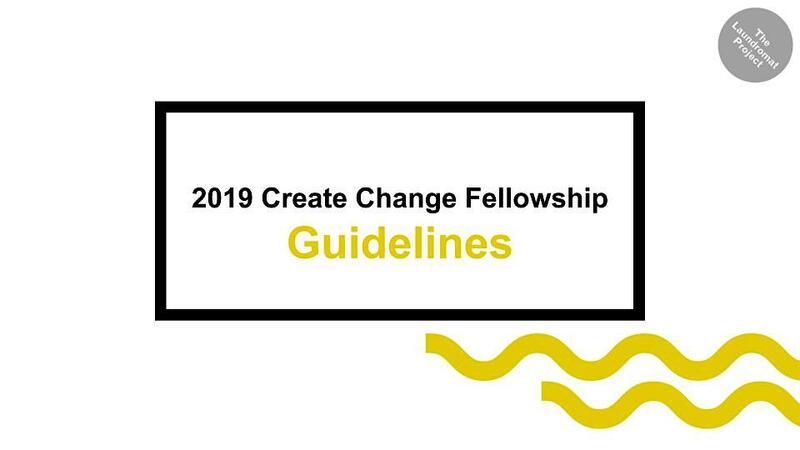 As the Create Change Fellowship champions a practice-base model, the program culminates in site-specific team projects by Fellows through partnerships established across select anchor neighborhoods. This opportunity is open to artists, activists, and neighbors at all stages of their creative practices and disciplines. Up to 12 Create Change Fellows from across New York City’s five boroughs, will be selected to participate in the 2019 program. This year’s Fellowship will center its activities within one anchor neighborhood – the Hunts Point / Longwood area of the South Bronx. Through the theme of abundance, Fellows will work on proposals for local cultural resources that center the voices and histories of long term residents, small business owners, youth, activists, cultural institutions, and artists throughout the neighborhood. Working in small groups, fellows will engage models of cultural asset mapping. Addressing where and how does culture take shape in 2019? How are aesthetics produced and in what ways do they evolve? What role does the commons play amidst rapid urban change and how are neighbors reshaping what it means to belong to a city, a neighborhood, or a block? Together, we hope to learn and contribute to the complex makings of cultural art production and civic engagement in the South Bronx. At the culmination of the program, fellows will activate local cultural resources through community exchange, cooperation, and zeroing in on our commitment towards valuing place. The 2019 Open Call cycle is now closed. More details on the 2020 cycle will become available in the Fall. The in-person interview date for shortlisted Fellowship applicants is Saturday, March 16. Shortlisted applicants will be notified on March 8. For the third year, the Create Change Fellowship is offered FREE of charge, thanks to the generosity of the Andy Warhol Foundation. However, participants will be required to put down a refundable deposit of $100 that will be returned after successful completion of the program (successful participation amounts to at least participating in 90% of all program activities, including workshops, open studios, group projects, and planning meetings, among other activities). Should I already identify as a community-based artist or one that incorporates social practice within my work? Not necessarily. We realize that traditional models of formal training for visual artists (be they based in universities or facilitated through residencies emphasizing individual aesthetic and/or professional development) quite often do not fully prepare them to work with and in a community in a sustained or even substantive way. As our flagship program, Create Change was created to offer artists an opportunity to deepen or develop a public art practice that graduates from a model of placing static art objects in public spaces to one that emphasizes the ways art and artists can serve as catalysts for social action and relationship building (not just contemplation). We realize that some artists may not identify as community-based artists or social practitioners, but are curious about making work in this way. We created the Professional Development Fellowship to provide a space where artists can build on their approaches to community-based art making and explore various approaches to collaborative art making. What if I am a writer, performing artist? Do I have to be a “visual artist” to apply? Artists working in any art form are eligible to apply as long as they are interested in community-based art making. No matter the accepted applicants’ medium, Fellows will work together to develop a community-based, socially-relevant and socially-engaged project. I’ve already participated in several professional development workshops. What does this program offer that is unique? The Create Change Fellowship is not a typical series of professional development workshops. Some of the topics and themes covered every year include: cultural organizing and community organizing, building local partnerships, deep listening skills, policy approaches for artists, sustaining one’s practice, and communication strategies. Our workshops are led by experts from the arts, community organizing, policy, and other related fields. We also believe in the tenets of popular education and draw from the immense and diverse knowledge of the Fellows themselves, whenever possible. This Fellowship also allows artists to learn by doing while creating a project collaboratively with other Fellows and community members. This powerful and experiential form of learning is central to The LP’s mission and core values, which we imbue in all of our programs. Besides concrete skills and experiential learning opportunities, one of the greatest benefits we offer our artists is a network of like-minded practitioners making socially engaged and relevant art across mediums. The LP’s rich network includes local and national peers, activists, arts professionals, curators, funders, and change agents and over 50 Create Change alumni living and working in New York’s five boroughs and nearby cities like Jersey City, Yonkers and Philadelphia. Upon completion of this program, all Fellows receive a certificate and become eligible for exclusive alumni opportunities, such as LP grants and commissions for future creative projects. Do I have to be a professional artist to apply? How do you define a professional artist? As a community-based program we recognize that there are many accomplished artists who do not identify themselves as “professional artists” and/or do not earn their living solely from art-making. Successful applicants will be able to demonstrate that they have a record of relevant artistic experience; a solid creative practice; and analytical thinking skills to offer to workshop discussions. What is the time commitment for the Professional Development Fellowship? Fellows will spend roughly 50 hours participating in professional development trainings, workshops, and discussions, but should plan to spend roughly 150 hours attending potluck salons, planning group project, and meeting with neighbors, community-based organizations and businesses in The LP’s anchor neighborhoods. Can I apply if I am currently enrolled to a part-time or full-time college or graduate program? Yes, you are eligible to apply so long as you are able to commit to participate in all Fellowship activities. Fellows are expected to commit approximately 200 hours over 6 months to participate in this program. All Create Change Fellowship projects this year will take place in the Hunts Point / Longwood community in the South Bronx. Fellows will engage directly with community residents and partners at the Kelly Street Collaborative Space, our creative community hub in partnership with Workforce Housing Group, Kelly Street Garden, and Banana Kelly Community Improvement Association. For the past four years, The LP has transformed a 2 bedroom-apartment on Kelly Street into a thriving creative community hub, with artist studios, arts programming, and community partnerships. The Hunts Point / Longwood Fellows will have access to space, located at The Kelly Street Collaborative Space, to work from and possibilities to engage the larger Kelly Street community with LP staff support.